I made this pasta salad for a work cook out, but it’d also be perfect for a Father’s Day BBQ. I was able to use some of the fresh asparagus from my CSA farm box! This recipe was inspired by apples and sparkle . In a large bowl combine the olive oil, balsamic vinegar, basil, garlic, red pepper flakes. Add salt and pepper to taste. Mix together and remove 3 tablespoons of the vinaigrette and place into a medium sized bowl. In large dutch oven, bring 4 quarts of water to a boil, add 1 tablespoon of salt and the asparagus. Cook until just barley tender (about 3 mintues). Use slotted spoon to remove asparagus pieces, place in colander, and rinse under cold water until cool. Add pasta to boiling water and cook until done. Drain pasta and add the hot pasta to the large bowl and toss to coat in the dressing. 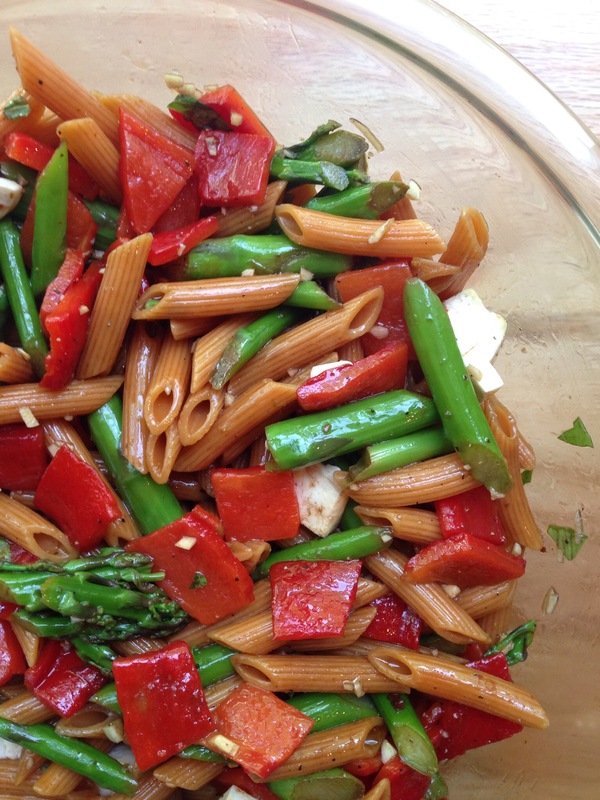 Add the roasted red peppers and mozzarella to the bowl with the asparagus and mix in the vinaigrette. Once the pasta has cooled, add the asparagus mix to the bowl of pasta.